Dungarvan, the administrative headquarters for County Waterford, is a strategically located town on the south-east coast of ireland. In the late 1800's excavations at a local cave uncovered Ireland's only cache of Mammoth elephant bones. Some 40,000 years ago, Dungarvan Town provided ideal living conditions for wooly mammoths, horses, and giant ground sloths. Stone age settlements have been found in the area around the town, but Dungarvan's history really began in the third century, when a tribe called the Deise settled there. The original Irish name of the town, Dun Garbhan (Garbhan's Fort) takes its name from Saint Garbhan, who founded a church there in the seventh century. 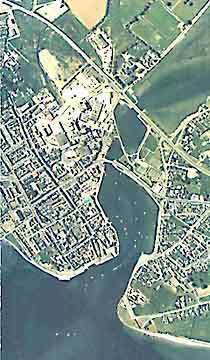 The town grew into an urban centre in the shelter of a large Anglo-Norman fortification founded in 1185. In 1215 the town was granted a charter by King John. Recent excavations have revealed much about Dungarvan's early history. As a town, it really only came into existence in the Norman period. A church at the top of the town was linked to the castle by a single street - still called Church Street. A wall on the land side of the town ran from the church to the castle. For centuries after, Dungarvan was noted for its thriving hake fishery. The town walls were extended to cover the seaward side, and a large commercial pottery operated just outside these new walls. The spectacular turreted castle of King John's time was radically redesigned in the 1400's to accommodate cannons. They weren't protection enough, for in the late 1400's the castle was captured - and blown up. Oliver Cromwell marched his army into Dungarvan in 1649 and spared the town after a local woman offered him a goblet of wine during his victorious entry into the city gates. In the aftermath of the 1798 rebellion, rebel leaders were publicly hanged from the Market House and heads were displayed on poles from the remaining castle tower. In the early nineteenth century Dungarvan was re-planned by the fifth and sixth Dukes of Devonshire, when a new square, streets and a bridge were constructed. Today it is a thriving business and residential centre, providing an appealing blend of traditional and modern lifestyles.